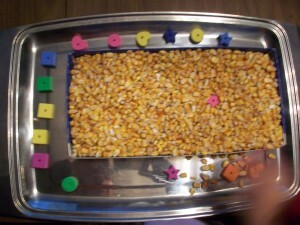 Purpose: This activity encourages fine motor skills and tactile input. Materials: glue, shoe box top, matching small objects and any tactile medium. We used matching foam shapes and dried corn for our project. 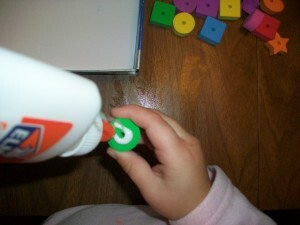 Step 1: Have the child glue on one set of the matching objects on to the box top. Let dry for 24 hours. 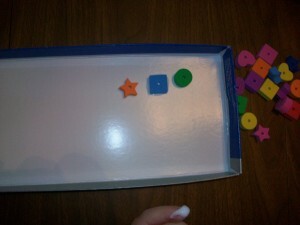 Step 2: Place the box top on a large tray with the matching objects around the box top. Pour the tactile medium into the box top. For this example we used dried corn. 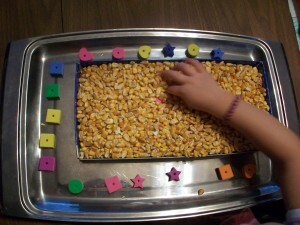 Step 3: Now the child should search through the corn to find the matching objects. 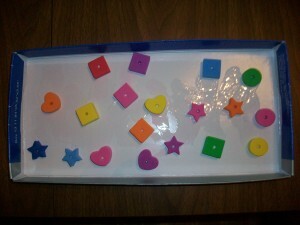 The child can dig and trace fingers around each shape. 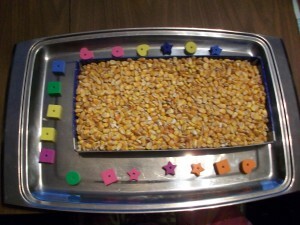 Once a shape is found in the corn, remove the matching shape off of the tray. Continue until all shapes have been found.